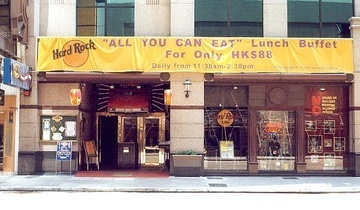 The first Hard Rock Cafe in Hong Kong, Kowloon was open from November, 1994 to January 1998. It reopened as Hard Rock Cafe Kowloon at a new location a short distance down the street in April 2000. During 2004 they changed their name to Hard Rock Cafe Hong Kong (see 2nd photo). This location remained open until November 2008.